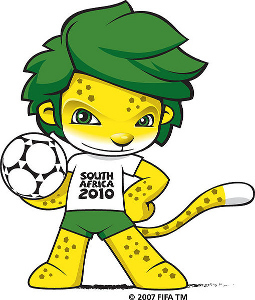 We are now just over 50 days away from the beginning of the 2010 FIFA World Cup to be held in South Africa. Unfortunately Jamaica didn’t make it to the finals but Japan did, but just how realistic is Japan’s chances of having a successful tournament this time around? Their best finish came as hosts at Korea/Japan 2002, when they won Group H but fizzled out in the second round. The Blue Samurai of Japan are in group E along with Denmark, Cameroon and the Netherlands. According to the latest FIFA rankings the Netherlands and Cameroon should advance as they are ranked highest at 3rd and 20th best in the world respectively while Denmark is ranked 34th and Japan the lowest in the group at 45th best in the world. Although they are the lowest ranked in their group I still believe Japan has an outside chance of sneaking into the round of sixteen. Their first match is on June 14th against Cameroon, their second match is on June 19th against the mighty Dutch and their final match is on June 24 against Denmark. I seriously don’t believe Japan has a chance at beating the Netherlands but if they can beat Cameroon who might be a bit nervy in their first match in front of an expectant African crowd in the stadium and then go on to beat or draw with Denmark they have a chance of going through behind the Netherlands if the Dutch win all their matches as expected. Explanations related to why I chose these teams in a later post ^_^, until then, I’d like to hear from those reading this – post a comment below stating how well (or not so well) the Blue Samurai will do at the upcoming World Cup and your prediction of the winner. Hehehe… our family might be able to better enjoy this World Cup… last time around Japan and Australia were in the same group (F)… and the game between Australia and Japan was a heated affair… Let’s just say one of us was happy, the other wasn’t. My wife (T-chan) lost interest pretty quickly after that game. This time, we can both support Japan AND Australia. Chances are slim, even if they pass the group matches. Later it’s much harder. I Have to agree with you on Spain and Argentina but England has a pretty slim chance of winning the World Cup . If I Have to choose between 3 Countries on winning the world cup it’ll be Germany , Argentina and Saudi Arabia .